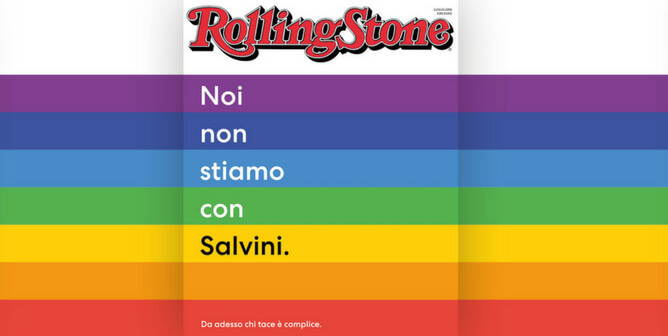 This is the main (and only) theme of the new cover of the famous magazine “Rolling Stone” in Italy. The editorial board of the 50-aged periodical decided to request support from musicians, actors, artists, writers and influential people from showbusiness. The aim of this action is to go against the Italian Vice-Prime Minister Matteo Salvini, in charge for nearly a month. Those are their words, the words of a paper that always represented the will to take part in political and social life, always supportting the fringes of society and always taking courage to express themselves, without being afraid of the consequences. This news comes out in a very hard time for Italy. The whole country is divided, lacerated by a hate that you can feel in the air. Since the new Government was inaugurated, nothing about the social climate has improved. It’s easy to take advantage the general dissatisfaction, and it’s also easy try to feed the anger towards those who are different; the truth is that Italy is tired of being played, but it doesn’t do anything to overcome this situation. Most people deal with the anger about immigration themes, poverty, health care but they don’t notice that they have to face the biggest antagonist they ever faced: the possibilty of retutrning back to the past. Everybody know the quotes “History teaches”. Let’s make us sure to understand what it means, and, most importantly, why it has such a deep meaning. They close their rainbow-coloured first page with the phrase “chi tace è complice” – “silence means consent”. It doesn’t really matter if you don’t agree with the theme that Rolling Stone Italy is taking on: you just have to recognize their courage and their willpower, that’s why having a comparison is so much better than not having it, that what everyone thinks around the world is a battle worth fighting, but just throw paper and words.